Ministry Textile Jute Job Circular 2018. Ministry of Textile and Jute (MOTJ) will recruit Vacancies for Various Posts for the year 2018. Interested and eligible Bangladeshi Citizenship Candidates are requested to Apply for the vacant positions. The Deadline for submitting Application is See the attached image job Circular for Details. 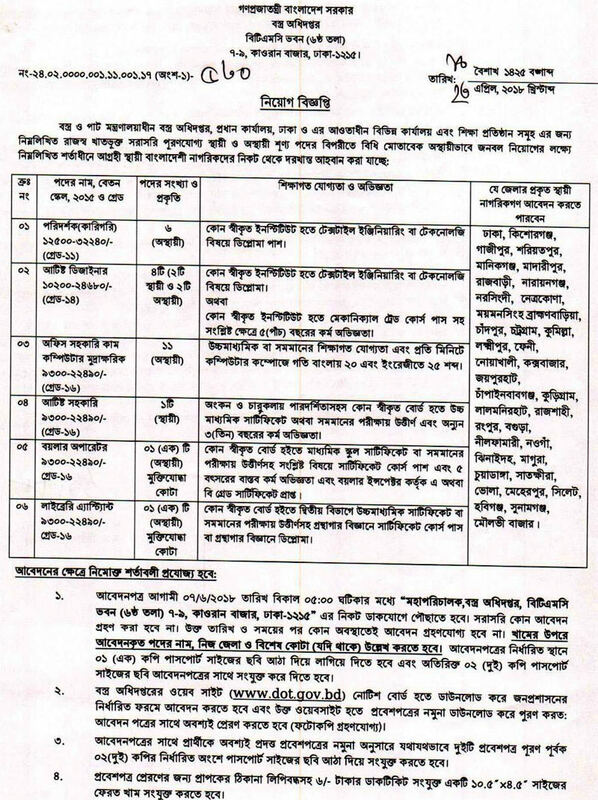 How to Apply: Interested candidates may Apply through a particular Application Form provide BJMC Website www.bjmc.gov.bd. The Secretary, Bangladesh Jute Mills Corporation (BJMC), Adamjee Court, Anex-1 (4th Floor),115-120 Motijheel C/A, Dhaka-1000. Ministry Textile Jute Job Circular 2018. Interest and eligible candidates are requested to through only through the Website i.e. http://motj.teletalk.com.bd/home.php. Candidates are requested to apply after fulfilling the circularized conditions and instructions. See the above recruitment circular for details. The Deadline for Application is See the attached image job Circular for Details.